Fans of JUDAS PRIEST, RISING FORCE, IRON MAIDEN, and BATALLION rejoice! 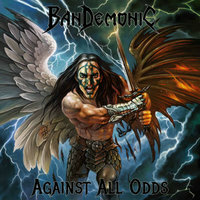 Greek true Heavy Metal powerhouse BANDEMONIC have released a rocking new album that harkens back to the olden days when Metal was its own genre, and its name is "Against All Odds". While Greece is better known for its Thrash and Black Metal scenes, there are the few and far between who dare to do something different, and in this sphere, BANDEMONIC does not disappoint. "Against All Odds" opens with its title track, and wastes no time on flashy intros or ambient soundscapes. The song begins instantly with a few well-timed bass kicks and snare shots, and then falls immediately into a full on Metal assault. Vibrating vocals soar like a powerful bird of prey in search of its next meal. Dual guitars chop away like the blade of an ancient warrior fighting for glory. Drums punch through the speakers as if they were a gladiator's heartbeat, courting a bouncy, melodic bass line. It is all at once obvious that these guys came to pay tribute to the good old days when Metal was nothing more than Metal, and DAMN, they do it right! As a fan of Metal in its infancy, it is very refreshing to hear a group such as BANDEMONIC, who execute real Heavy Metal, rather than blending several genres into what turns out to be (for the most part) a chaotic mess. If done correctly, this is the kind of stuff that brings you back to your youth, and I, for one, am of the opinion that "Against All Odds" delivers on just that level. The record rolls along nicely, not letting up at all. "Of Lies And Shadows", the fourth track, is definitely a standout with its constantly changing melodies, nice breaks, smashing double-bass kicks, and wicked guitar solo. Track five, "Ocean Of Tears", is a perfect follow-up; with its deep, rolling bass line providing a perfect backdrop for its DOKKEN-esque feel. These two songs fill the meat of the record nicely, setting the stage for the final hurrah. "Against All Odds", as it reaches its final two tracks, proves itself to be a breath of fresh air for those craving Heavy Metal the way it was meant to be played. "Unbent Unbowed Unbroken" is equal parts early 1990s TESTAMENT and "Rage For Order"-era QUEENSRYCHE, taking the listener back in time (once again), and providing a perfect soundtrack for some good, old fashioned headbanging. The album closes with the phenomenal song "Far Away", its beautiful intro morphing into an old school titan of a track in which the wah pedal sings with a voice all its own. This song is both emotional and wonderfully executed, changing its pace throughout, and showing the ability to retain its nearly perfect song structure until it fades out, revealing softly played piano keys that end the album with grace and dignity.